We speak with Mariana Gómez Soto (Yes to Life, No to Mining’s Latin America coordinator in Colombia), about the referendum, how it has affected political life in Colombia, and how this success story in Cajamarca has inspired other movements in the region and around the world. In 2009, South Africa’s AngloGold Ashanti (AGA), the world’s third largest gold mining company, began exploratory plans on what was thought to become the world’s fifth highest gold producing mine (per annum) in the world. The “La Colosa” gold mine and the town of Cajamarca, located in the Andean Colombian state of Tolima, were primed to become one of the biggest mining sites in Latin America. 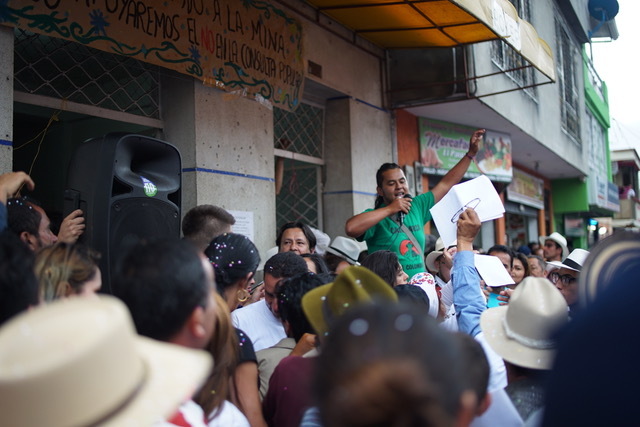 Grassroots activists, farmers, scientists and NGOs had repeatedly pointed out that the negative economic, environmental and social impacts of a mine as big as La Colosa would be vast. Local grassroots movements began to mobilize against the mining project. After a 10-year nonviolent campaign coordinated by grassroots activists and international support, the town of Cajamarca voted with a 97.9% majority to say “No” to AGAs plans in a referendum (“consulta popular”) held last March. AGA has now halted its project entirely, is pulling out, and says that it accepts the validity of the vote. Karibu: What was the process leading up to the referendum on AngloGold Ashanti in 2017? Two networks in the municipality started coordinating the mobilisations for the referendum (Comité Ambiental en Defensa de la Vida and the youth collective COSAJUCA – both members of YLNM). YLNM then supported this process by providing support, advice, access to legal experts and international solidarity when needed. YLNM also helped to develop education materials on how the mining would impact agriculture and water supply. We also worked to mobilise the financial support necessary to hold the referendum (transport from rural areas to voting booths, information points, publicity, educational materials etc). In Colombia, the law establishes that when over one third of the possible voters participate, and the decision is voted by a majority of over 50%, it is obligatory for the municipal government to uphold the decision of the people. We secured these numbers, and a 97.9% majority vote said no to La Colosa in Cajamarca! AGA has halted all of its projects last year, and said in a statement that it “accepted” the result of the vote. Tell us about what’s been happening in Cajamarca since mining was banned a year ago. What positive actions have been taken? It is often said by proponents of mining that if you are anti-mining, you are anti-development. This is not the case. Since the referendum, it has been a priority to strengthen the local economy and build alternatives rooted in the territory and its true treasures- natural beauty and small-scale agriculture. We’ve been starting new collaborations with businesses interested in buying local products directly from producers. For example, Crepes and Waffles, a Colombian restaurant, visited Cajamarca just a week after the popular referendum and has begun a relationship with the association of arracacha (an Andean root vegetable) growers in order to buy directly from them. The restaurant is including new meals produced with arracacha products on their menus, which has carried news of Cajamarca’s true wealth further. And through them there was an exhibition celebrating Cajamarca’s ‘true treasure’ at the Bogota Museum of Modern Art. What has the impact of Cajamarca’s referendum in Colombia more widely? The referendum helped trigger a boom of democratic participation across the country that is a victory in itself. There have been seven other successful referendums since Cajamarca’s. These have all rejected extractive projects in a constitutional way. Twenty-three additional referendums are in process, and over other 70 municipalities in total have now expressed their intention to hold their own referendums. The Government is resisting this, however. Mining is at the centre of their development plans and they have close ties to industry, so they are trying many avenues to limit the consultations and not to recognise those that have already happened. Despite this, the victory in Cajamarca gave the social movements in the region confidence. Supported by Yes to Life, No to Mining and others, they have begun sharing their experience with these other municipalities and internationally, too. Cajamarca and other municipalities are showing great political maturity. People are not blocking roads or setting things on fire. People are participating and really exercising democracy in a direct way. What is the significance of what has happened in Cajamarca in the context of the peace process and Colombia’s presidential elections? In January, four of our presidential candidates came together for a debate on topics relating to the environment. The first question they were asked was about the referendums and mining. This showed us that social movements in Colombia, and Cajamarca specifically, have successfully elevated the discussion. Politicians are having to take a position and many are supportive. There are some right-wing candidates who have said that they will limit the referendums. They want more mining and at the moment there is a strong possibility the peace process could open up areas that were worst hit by the conflict to mining investment to help them ‘develop’. This is one of the reasons the Government is trying to limit referendums, popular consultations and social movements- they think they will scare investors away. But Cajamarca has demonstrated that the peace process needs to create sustainable possibilities for the communities and areas most affected by the conflict. The extractive development model brings conflict and injustice, not peace. With the impacts of extractivism being felt all over the world, what lessons does Cajamarca have to share beyond Colombia? The first thing is that it’s possible to fight the giant and to win. Their interests can be tackled but we have identified it is key to start mobilization early, before mining has begun, in order to be successful. Secondly, and most importantly, Cajamarca demonstrates that we must not only stop particular projects but change our paradigm. People are not just asking for an end to one mining project. This is a groundswell calling for a new development model rooted in alternatives that serve the well being of the planet and the people. Mariana is a Colombian environmentalist, anthropologist and Latin American Coordinator of the global Yes to Life, No to Mining solidarity network. Mariana first got involved with grassroots movements in defence of territory when a gold mining corporation arrived in her home region of Piedras to establish La Colosa´s tailings dam. She works with Gaia Amazonas to support indigenous and peasant communities to strengthen local traditional knowledge and sustain their territories, and currently coordinates a macro-regional initiative that aims for the maintenance of ecosystem connectivity in the Amazon. Learn more about the case in Cajamarca, and how it is inspiring other movements in both the South and the North, in this video produced by Yes to Life, No to Mining and the Gaia Foundation. Mariana is featured in the clip, and provides narration. In Solidarity – En Solidaridad on Vimeo.